Looking for a new challenge in the veggie garden this spring? Here’s a sweet enough reason to save a small patch of fertile soil for something different. There are loads of factoids about the many different varieties of sweet potatoes but it is Friday so no technical lingo and no dabbling in the sweet potato vs. yam debate. 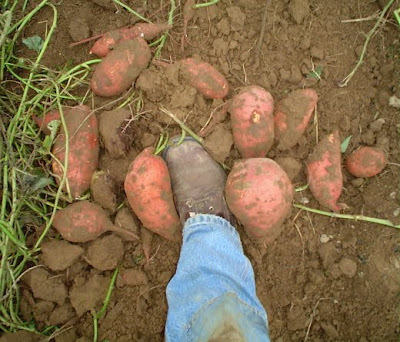 Although a bit pricier for its bareroot than a regular potato, the growing conditions are similar – good organic soil, plentiful water and warm temperatures. It helps to use black plastic to keep the weeds down and offer extra toasty conditions, specifically in the colder climates. So if you are looking for a sweet reason to be thinking about spring, let’s think sweet potatoes. Although Douglas Adams reminds us that “It is a mistake to think you can solve any major problems just with potatoes,” I’m going with a bit of Lennyism from Lenny Kravitz. “My dream is to become a farmer. Just a Bohemian guy pulling up his own sweet potatoes for dinner.” Have a great weekend and don’t forget to post your favorite sweet potato cooking tips. P.S. For anyone subscribing via email that prefers to reply direct, I’ll keep an email address in the blog agbilowz@comcast.net. You can always post on our fan page http://www.facebook.com/pages/Bilowz-Associates-Inc-Our-Blog-Annies-Gardening-Corner/325316334444 or follow me on twitter http://twitter.com/annbilowz.